Wolf Technical Services received a Phase I SBIR award in 2017 to development an aircrew-mounted self-adjusting tether system that protects mobile aircrew in military helicopters from ejection during mishaps, from contact and flail injuries during mishaps and from falls through aircraft openings, all while still allowing them the freedom to conduct all required mission activities. The Wolf Technical Inline Mobile Aircrew Restraint System (IMARS) provides both crash protection and fall protection and at the same time it is compatible with all aircraft attachment locations where the gunner’s belt or similar restraint is currently used. It interfaces and is compatible with the CMU-37/P Aircrew Endurance Vest (AEV) and other similar vests. It automatically manages the slack in webbing between the crewmember and the aircraft attachment point. It does not interfere with crew duties by locking inadvertently, by requiring the crewmember to interrupt mission duties to unlock or release it, or by causing fatigue to the crewmember. 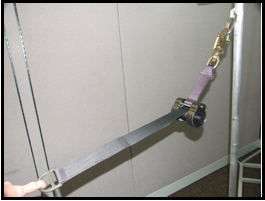 In order to provide the required protection at all locations in the cabin, the webbing payout easily adjusts in its maximum payout length so as to reduce the likelihood of aircrew excursion through any aircraft opening, and to reduce the incidence of contact with other aircraft structures.